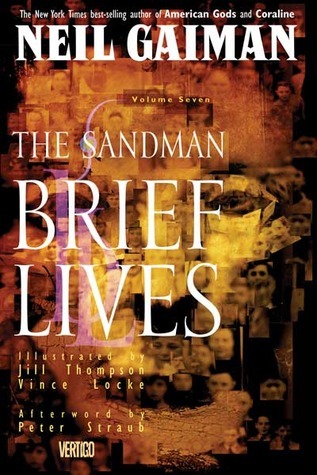 Brief Lives probably has the most cohesive plot of any of the Sandman collections, excepting maybe Volume 9, The Kindly Ones. In this collection, Delirium, youngest of the Endless, has conceived a fierce need to go in search of “the Prodigal”, Destruction, the middle of the siblings, who has abandoned his realm and who has not been seen in some 300 years. But she doesn’t want to go it alone (and is vaguely aware that she can’t, fractured and unstable as she is). She first asks the twins, the siblings nearest to her in age, Desire and Despair; both refuse. Then she asks Dream, who, surprisingly, consents — though his reasons have little to do with helping Delirium or finding Destruction, and far more to do with having an excuse to walk in the mortal world. Nuala: Brrr. Listen to that thunder. Poor Lord Morpheus. He must be very sad. Mervyn: Nah. He enjoys it. I mean, hell, it’s a pose. Y’know? He spends a coupla months hanging out with a new broad. Then one day the magic’s worn off, and he goes back to work, and she takes a hike. Now, guys like me, ordinary Joes, we just shrug our shoulders, say, hey, that’s life, flick it if you can’t take a joke. Not him. Oh no. He’s gotta be the tragic figure standing out in the rain, mournin’ the loss of his beloved, so down comes the rain, right on cue. In the meantime everybody gets dreams fulla existential angst and wakes up feeling like hell. And we all get wet. I like this little poke at the Dream-lord’s massive ego — he is, in many ways, a figure that takes himself quite seriously (as his sister Death frequently reminds him). So, both to shake himself out of this depressive fit — but also hoping that he might cross paths with his ex-lover — Dream agrees to accompany his sister on the search. There are not many of them, all things considered: the truly old. Even on this planet, in this age, when people consider a mere hundred years, or a thousand, to be an unusual span. There are, for example, less than ten thousand humanoid individuals alive on this planet today who have personal memories of the saber-toothed tiger, the megatherium, the cave bear. There are today less than a thousand who walked the streets of Atlantis (the first Atlantis. The other lands that bore that name were shadows, echo-Atlantises, myth lands, an they came later). There are roughly seventy people walking the earth, human to all appearances (and in a few cases, to all medical tests currently available), who were alive before the earth had begun to congeal from gas and dust. How well do you know your neighbors? Your friends? Your lovers? They are there too, the old ones. I love that passage. It’s chilling, unsettling, and somehow inspirational, all at the same time (a Gaiman specialty). And the first of these that we meet, we meet at his death; Bernie Capax remembers the stink of mammoth during his morning commute, and moments later, gets crushed by a construction site accident. He doesn’t want to believe it at first — after all, he’d made it so long, and for it to end like this? Who could blame him for feeling cheated at the last? But, as Death reminds him, “You lived what anybody gets, Bernie. You got a lifetime. No more. No less.” We find out later that Bernie was on Delirium’s list; somehow, Destruction left a trip-wire in his wake that’s disrupting any attempts to find him, often at great cost. Dream and Del also incur some purely mortal collateral damage, as accidents and mishaps plague their travel. Eventually, Dream throws in the towel; he’s had enough, he isn’t getting what he wanted out of the trip anyway, and he’s tired of their efforts getting people killed. Delirium takes this poorly, throwing a fit, retreating to her realm, and locking it down; Death intervenes, chastising Dream for being callous and selfish, and he agrees to try again. After coaxing Del back out, the pair journeys to their eldest brother, Destiny, who tells them to seek out an Oracle who is of the Family — Dream’s son Orpheus. Orpheus reveals Destruction’s location in exchange for a boon which he can claim from his father; despite knowing full well what price he’s going to have to pay, Dream agrees, and off they go to find Destruction — who is, as fate would have it, on an island neighboring the one where Orpheus has been kept all these years. The meeting is, if anything, anticlimactic. Destruction reiterates his reasons for leaving his realm — he doesn’t think that the Endless should behave as they do, toying with mortals and governing their lives — that mortals quite have the hang of it now on their own, and the functions of the Endless can go on without their personal supervision. (Clearly this is correct for Destruction — we do a plenty good job of that — but what happened with Dream’s absence from his realm at the very beginning of the series calls the truth of his assertion into question). The conversation ends to no one’s satisfaction, and Destruction decides to pack up and go on the move again. Dream returns to the other island and kills his son, at Orpheus’s own request. I know how gods begin, Roger. We start as dreams. Then we walk out of dreams into the land. We are worshipped and loved, and take power to ourselves. And then one day there’s no one left to worship us. And in the end, each little god and goddess takes its last journey back into dreams. … And what comes after, not even we know. She’s a stunner, to the end, and no mistake, and she makes a powerful statement — even the gods are not truly immortal; only the Endless are, and even they, as we learn in this collection, can falter, perish, and be replaced by a new aspect of themselves. Brief Lives also includes, in a flashback to the seventeenth century, an interesting commentary on Reason. Poised at the edge of the Age of Enlightenment, Destruction comments that man has turned away from other methods of explaining the world and has focused on reason.” It is no more reliable a tool than instinct, myth, or dream. But it has the potential to be far more dangerous.” Dream agrees that it is a flawed tool at best. This is an interesting thing to consider, from a modern standpoint, in an age when science and faith so often find themselves at loggerheads — when we debate whether or not evolution should be taught in schools and whether or not religion ought to be allowed to govern what women can do with their own bodies. It’s interesting for me in particular because I somewhat straddle the line where reason is concerned. I love science, believe in science, am fascinated by science — but I have faith, too. I don’t see that the two have to be incompatible — the world is no less miraculous just because it’s composed of atoms and forces and chemical reactions — and yet there are so many who would insist on making them enemies. I think we need all of those things — instinct, myth, dream, and reason — in balance, to be the best versions of humanity that we can be. But that is, of course, only my own musing on the topic; I do love when Gaiman makes me think these thoughts. I am of the opinion that the Sandman graphic novel series is one of the most staggering works of creative genius that the last hundred years has given us. I think it’s an utter masterpiece, a towering vision of imagination and veracity. It’s a series that has so much to say, that you can return to again and again and always notice something new. It’s a story that, as only the best stories do, lays open the heart of humanity, exposes it raw, and then somehow massages new life into it — or perhaps just breathes the spark of awareness back into the reader, so that we see truths that were always there but had never noticed, or forgotten. I think it’s complex and magnificent, a paean to storytelling, a love song between mortality and eternity. Unfortunately, I don’t much like the first volume in the series. Oh, there are things about it that I like, but on the whole, it’s one of the less impressive installations. And then even those parts of the story which may demonstrate great technical merit fall into the category of “so not my thing”, which impedes my enjoyment. The first issue is one of the better ones — or at least one of the ones I enjoy more. It tells the story of how an Edwardian magician, just after the Great War, determines to capture Death, so that no one ever need suffer again as so many did during that global crisis. Unfortunately, the spell goes awry, and Alexander Burgess ends up accidentally imprisoning Death’s younger brother — Dream. In the wake of Dream’s captivity, strange things begin happening in the mortal world — people who either fall asleep interminably or are unable to sleep at all, who lose the ability to dream or who find themselves trapped in nightmares. Dream also loses three important possessions: his helm, his bag of sand, and a ruby in which he has stored much of his power. 72 years pass before Dream can free himself, and when he does, his mission is one of both recovery and revenge. His journeys take him throughout the mortal realm, into Hell, and into the tattered remnants of his realm, the Dreamworld, falling to pieces in his absence. I think part of the problem I have with this book is the element of the grotesque — especially in the art, and especially in the art of John Dee. Slobbering, slimy, melting, sloughing off John Dee — the man who ends up in possession of Dream’s ruby, a deteriorating psychopath who uses its powers for horrific evils. Gaiman himself describes the issue “24 Hours”, in which Dee sadistically manipulates a group of people in a diner to gut-wrenchingly awful circumstances and eventually deaths, as one of the few truly horrific things he’s ever written. And in writing and art both, technically, it’s well-done — Dee is, after all, supposed to be repulsive, and the story is meant as horror, so in the sense that the artist achieved the desired effect, it’s a success. But I don’t like being repulsed by things. I don’t pick up books hoping to feel my stomach churn. For that reason, I’m generally not much for the horror genre, and for the first few issues, that’s what Sandman thought it was. It moves much more strongly into metaphysical fantasy later on (which is when I start cleaving so enthusiastically to it). 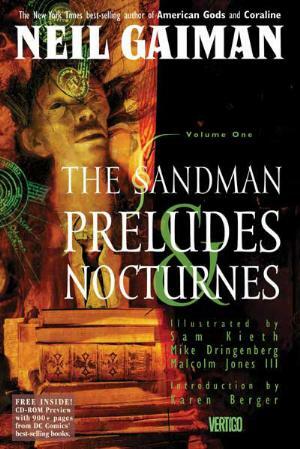 The initial horror focus, though, is just one of the ways in which the series clearly takes a little while to find its feet — which Gaiman admits in, among other places, The Sandman Companion (which I’m reading in conjunction with the series). The attempts to mate his imagined universe with the existing canon of the DC-verse isn’t particularly smooth (a trouble that the next collection also has, but that eventually ebbs away). The incorporation of the Justice League International is pretty awkward, and it’s for the best when that connection gets more or less broken. For my money, though, the best issue in the collection is the last, “The Sound of Her Wings,” wherein we meet Death, another member of Dream’s family, the Endless. This is the first issue where you truly get a sense of the scope of the series, as well as its arching mythology. Dream, moping over his recent trials, has some sense beaten into him (via a loaf of bread) by his big sister. She then takes him with her throughout a typical afternoon, as she welcomes mortals of all kinds into her embrace. It’s an iconic story, and one that sets the tone that I think defines the series far more than the preceding issues do. (It echoes later, in The Kindly Ones, but that explanation will come along later). This collection is aptly named. As Preludes, these issues set up the series to come, previewing but not explaining, testing the waters before plunging in the deep. Gaiman had to find his ground, and it takes a little while. As Nocturnes, they are stories of darkness and depravity, of the alarming recesses of human psychology and inhuman torment. Ultimately, these are not the issues I enjoy. But I have to admire the technical merit, and it is something to see a writer’s process almost in-work, even from decades later.